HOW TO EVEN SKIN TONE COMPLEXION WITHOUT IRRITATING YOUR SKIN. LIGHTEN SKIN TONE COLOR IN NORMAL-TO-OILY SKIN WITH O'TENTIKA SKINTONE FORMULA. O'TENTIKA Skintone Formula shows you how to even skin tone. Made with Swiss ingenuity and an advanced blend of all-natural ingredients, the Skintone Formula will lighten and even skin tone color, fade away lines and wrinkles for a smoother appearance, and nourish your skin with the just the right amount of hydration to leave your skin glowing, not shining. You can relish in an even skin tone that washes away years from your appearance. Order today to leave your skin soft, sensuous and luminous. With a light, non-greasy formula, O'TENTIKA Skintone Formula is pleasing to use. Apply to freshly cleaned skin, massaging gently into your face and neck areas. Use twice a day for faster, more dramatic results. Allow a few moments to absorb fully before applying follow-up products. Use with our hygienic complexion soap or exfoliating soap for enhanced even skin tone color and skin health. Follow with our advanced C15 Serum on specific dark spots. 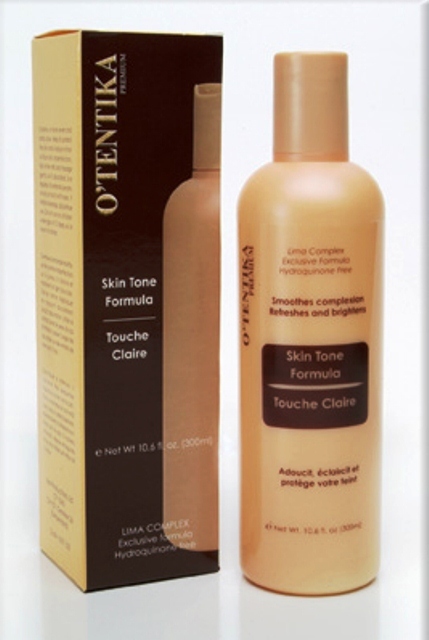 Like all similar beauty products, O'TENTIKA Skintone Formula is intended for external use only. Avoid contact with the eyes, and if irritation develops, reduce or discontinue use. Do not use on children under the age of 12. Finally, wash your hands frequently as you find yourself touching your soft, smooth facial skin more frequently.